Monday September 5th began with the first EAAS meeting of the new season and a large crowd had gathered to initiate this first of many new and exciting speakers and topics that we all look forward to throughout the new observing period. The meeting began with our chairman John McConnell giving a quick summary of the events and observing highlights from over the summer period since the last meeting. The volume of observations completed by EAAS members during this period was extremely high and impossible to cover in detail at the time so John had to be conservative with his choice of topics. The most recurrent and outstanding events were indeed the wide variety of day and night time atmospheric phenomena such as solar pillar’s, Haloes, Coronae, Parhelia etc. John informed us that he has never heard of so much activity in his 40 plus years of observing! 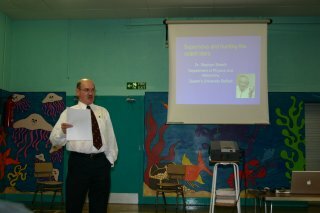 Our guest speaker was Stephen Smartt from the Queens University in Belfast and his topic was ‘ Supernovae - Hunting for Exploding Stars’. Stephen gave an excellent very detailed talk covering the history of these bright transient explosions within our own Galaxy and other Galaxies deep in space that took us on a journey to the present time were he educated us all on the latest offering’s from astronomers on the intricate details of how these explosions happen and introducing us to the personal lives of the stars which cause them. We learned about the vast differences between Type 1 and 2 Supernovae using a variety of amazing images obtained from ground based Observatories and the infamous Hubble Space telescope and delighted us with a wonderful animation of ‘Star Quakes’, indeed Stephen himself gets to spend time using the HST to choose target galaxies where he can study in detail the section of a spiral galaxies arm were the Supernova exploded giving him a chance to study the progenitor star and its stellar neighbour hood. He told us he gets to study and hold on to these images for a year before they are made available to other astronomers and the public! 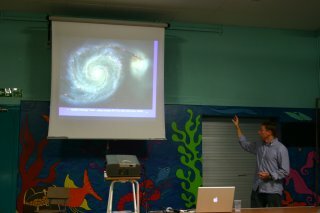 The talk delved into the role that amateur astronomers play by the actual discovery of both types of Supernovae using modest sized telescopes fitted with CCD cameras and complimented by a ‘GO-TO’ ability that can track down and image hundreds of galaxies per night. No talk on Supernova discovery can pass without the mention of the most prolific visual Supernova hunter on the planet, namely the Reverend Robert Evans who has made many discoveries using a 10” reflector and his own memory, infact Stephen talked in detail about one of his latest discoveries as well as the latest amateur discovery of a bright Supernova in the spiral galaxy M51. Stephen delivered a top class, very intricate up to date talk on this subject and his current research, which backed by his very clear, concise voice and fast flowing pace made this a talk not to be missed by anyone. 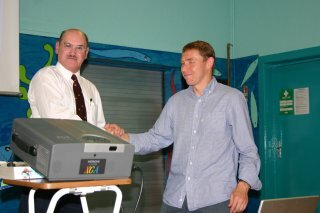 A fabulous question and answer session brought the meeting to a close. On behalf of the EAAS…thanks Stephen for a splendid evening! All content is Copyright © EAAS, authors and images.The East Antrim Astronomical Society is based in Ballyrobert, County Antrim, Northern Ireland.